I had a few questions for Josh, and he was kind enough to answer. 1. Josh, you’re one of the five writers who worked on Hobomancer. What were your main contributions? Josh Burnett: I contributed little bits here and there, but the monster section was my biggest contribution. I wrote most of that. I also wrote and drew the intro comic. 2. For you to spend so much time working on these books, you must like hobos. What is it about hobos that makes them so appealing? JB: Hobos kind of have this roguish disregard for societal rules that I find appealing for the same reason that I like Han Solo, the Gray Mouser, and other vagabond heroes. They go where they want, do what they need to, and survive by their wits and luck. Also, there's something primal and romantic about steam trains. They're these huge iron, smoke-belching monsters that we've tamed and whose power we've harnessed. 3. You’ve run plenty of Hobomancer games at conventions, including “Bad Train a-Coming.” Did running those games influence you in writing the Hobomancer Companion? What did you learn from con games that made its way into the book? 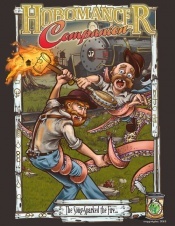 JB: Several of the new powers included in Hobomancer Companion were play-tested in convention games. The cool tricks that players came up while playing a "beardomancer" or "flame singer" helped me define and refine those powers. I ran "Bad Train a-Coming" at three different conventions, plus once online. Each group approached that adventure in a different way. I tried to touch on as many of these approaches as I could. There's a section in the Bad Train adventure that players should not be able to do, but I'll be darned if one of my convention groups didn't do it (and do it successfully!) anyway. I had to make sure I covered that in the adventure. Also, all players love dynamite. All players. 4. What do you most hope players and GMs take away from the Hobomancer Companion? JB: I hope players read it and say "Oh wow! I want my character to do that!" I hope GMs read it and say "Oh wow, I can't wait to have my players run into this!" I hope both players and GMs get inspired and come up with stuff that none of us had even thought of. 5. What inspired your take on vampires? JB: I thought it would be fun if hobomancers referred to all vampires as "Draculas." I also thought it would be fun if all the vampires in the settings were the classic tuxedo-and-cape-wearing, bat-transforming, garlic-avoiding blood suckers that we don't see any more. Steve Johnson asked me to make sure vampires still fit in with [upcoming Hex release] M-Force’s take on the monsters, though, since we want the two games to exist in the same world (if in different times). So I thought about it, and realized that the Bella Lugosi movie was pretty much brand new in the time that Hobomancer takes place. What, I thought, if all the world's vampires went through this strange "Draculation" phase for a few decades, where suddenly their powers all unified and they started wearing evening dress and talking in Hungarian accents? Maybe its a fad? Maybe it's something supernatural? I thought it was both absurd and cool enough to fit Hobomancer perfectly. 6. In the Companion, you write, “Hobomancer is a setting built to grow.” How would you like to see it grow? JB: I'd love to see more adventures published. I have two convention games I'd love to release to the public, "Suffer the Little Children" and "The Town that Loved Hobos." They both have very different themes and moods and show how varied different Hobomancer games can be. I'd love to see more monsters of course. I'd really like to see some things where we "zoom in" on different regions of the U.S. It would be cool to focus on the particular folklore and history of, say, Appalachia, or Big Sky Country, or the Pacific Northwest. Also the city. So much of Hobomancer assumes a rural or small-town setting. I'd love to see what happens when a group of hobomancers have to deal with trouble in, say, Chicago or New York or Saint Louis. Thanks, Josh! To learn more about Josh’s work, visit his blog at http://bernietheflumph.blogspot.com.